This is a story about why we do not need genetically engineered cotton. GMO cotton has bacterial genes inserted into the cotton plant genome with the “on-switch” gene permanently turned on so every cell of the cotton plant continuously produces pesticide. Bt cotton produces 10,000 times the amount of Bt toxin that would be sprayed on the crop. I know something about pest control in cotton. My entomologist/applied insect ecologist Dad, Everett (Deke) Dietrick, had me learn to drive in cotton fields. I dropped him on one end of a field and picked him up at the other end so he could monitor the insect ecology through the field. He did research at the University of California on biological pest control. He quit the University because the pesticide companies pressured the University to make sure nothing relevant was done or published about biocontrol. He set up an insectary business — growing a tiny wasp that kills cotton bollworm eggs. He was successful. Cotton growers in Coachella and Imperial Valley’s stopped spraying pesticides and sales of pesticides went down. Scientists from the Soviet Union heard about his success. He had an open door policy and they came to visit. The Soviets learned and improved on Deke’s biological control program and applied it in a string of 80 insectaries throughout the cotton producing region covering six Central Asian countries. 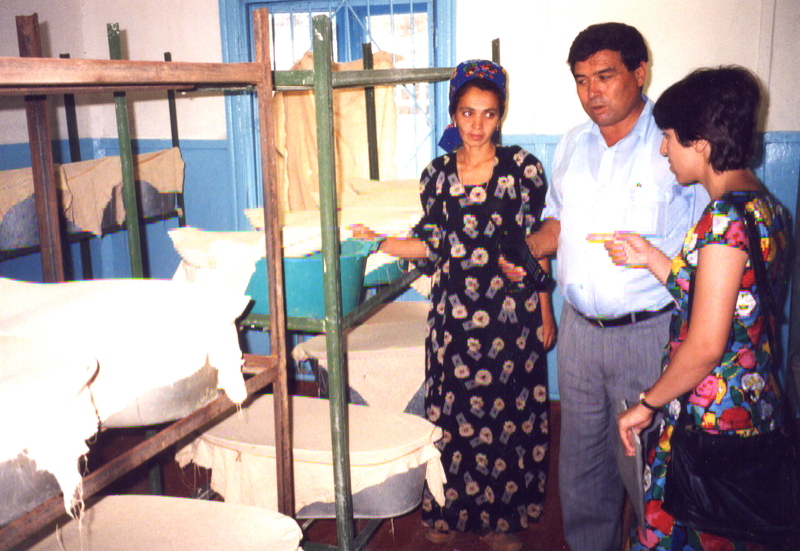 A couple decades later I was invited by the World Bank and by Mercy Corps to go to Turkmenistan and Uzbekistan to help the people who took over those insectaries to privatize them. I took this photo in a biofactory in Turkmenistan where they were growing Habrabracon hebetor as a second line of defense for cotton bollworm to back up the Trichogramma releases. I saw that they knew what they were doing and the system worked great, just like it did in Coachella and Imperial Valleys 30years earlier before the pesticide companies helped the pink bollworm move into the area (pesticide sales went back up). Bayer pesticide company sales reps in Turkmenistan were pushing pyrethroid pesticides. The pest control experts knew that would cause terrible secondary pest outbreaks and get them on the pesticide treadmill. They knew pesticides would mess things up. Their focus was on sales numbers verses helping the farmers. The Soviets proved in a huge area of central Asia, what my father had proved earlier–that it is possible to manage all pests of cotton, including cotton bollworm and tobacco budworm, in those two regions without pesticides. Meanwhile we watched as genetically engineered cotton was introduced with the Bt toxin engineered into the DNA of the plant. We knew that it is absolutely not necessary. Bt cotton was not created to solve an agricultural problem or bring a better technology. The best technology, natural biological control, was known and systematically destroyed. Bt cotton was created solely to increase profits for Monsanto. Farmers have been and are being denied access to knowledge about cost-effective methods because pesticide companies literally burned the books on biocontrol. Monsanto and friends (that bought up all the seed so they can engineer the genomes and patent them) profit from pushing Bt seed on farmers that don’t return benefits. They control the universities and much of the farm press. Natural methods aren’t patentable, and do not provide a profit margin that allows us to do competitive marketing. Farmers need a strong desire to transition off pesticides when they don’t really have strong support from the universities. Farmers who are in a learning mode can do it. Farmers and consumers: stop falling for the biotech lie that society needs the GMO seeds they are manipulating and patenting. Since government regulators are in biotech’s pocket, all we can do is reduce our use of what they have to sell. Stop buying GMO cotton – buy organic cotton, hemp, linen, silk, and wool or other fibers coming on the market. There is the thrift shop and creative ways to recycle fibers, like Patagonia’s Synchilla from soda bottles. With GMOs labeled, eating less GMO food is also going to have an impact. We need to boycott GMOs so we are not supporting the pesticide/GMO seed monopoly and for the sake of our health and the health of our environment.